Get Married on a Mountaintop: Attend Your Wedding in Banff, Alberta, and the Canadian Rockies On a Helicopter! 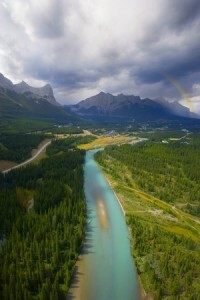 The Bow River in Banff National Park from the air. Sure, you get incredible, scenic alpine backdrops wherever you gaze around Banff, Canada and Banff National Park. But what about from the air? On that most special of days, your wedding day, what better backdrop to your nuptials could there be than floating above the most stunning mountain range in the world with the person you have just pledged to spend the rest of your life with? You can do that in Canmore, just a short 25 kilometers south of Banff on the Trans Canada Highway. There are a few different companies to choose from; one that offers the largest range of prices and times is Kananaskis Heli Tours. Whether you simply want a quick peek at the peaks of Alberta’s Canadian Rockies from above or something longer – and perhaps more romantic and unique – you can tailor your trip. If you want to pull out all the stops – and why not? After all, if all goes well, you only get married once, right? – you can chose Kananaskis Heli Tours’ Romance Package. The Romance Package is for people celebrating anniversaries, proposals, weddings or any other special occasion. It is a private helicopter experience with a one hour champagne stop in the wilderness. Aside from perhaps a hot air balloon across the pyramids in Egypt, it is hard to imagine a more romantic gesture. The Canadian Rockies and all of Alberta Province is a big healthy, welcoming, naturally beautiful wonderland. It is exactly the right place to celebrate a wedding. There is something about being in a helicopter, surrounded by the unspoiled natural majesty of the snow-capped mountains and the green alpine valleys and meadows, that makes you feel small and appreciative of the things you have. Get married on a Banff area mountain top with a helicopter wedding.